Natural Health Services encourage people to improve levels of physical activity and meet NHS recommended levels of exercise, which reduces need to access GP services and more expensive ‘downstream’ services such as A&E and inpatient services. 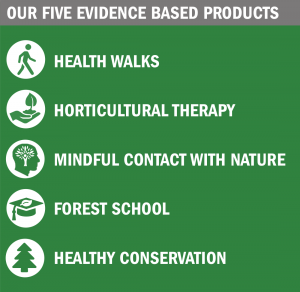 Our products help to deliver two of the objectives of the Marmot Review: Create and develop healthy and sustainable places and communities and strengthen the role and impact of ill-health prevention. We have carried out a Social Return on Investment (2016) study into an expanded Natural Health Service, working with around 6,000 people a year who are at high risk of developing a future need for expensive health services. This predicted a return on investment where for every £1.00 invested in the service, £6.75 social return will be generated. Products have been developed and tested through pilot projects and programmes across Merseyside. These have included the ‘Natural Choices’ programme in Liverpool and the Big Lottery funded ‘Nature4Health’ programme across Merseyside and North Cheshire. An evaluation of the Natural Choices programme in Liverpool by the University of Essex showed that a nine month programme of Natural Health Service type activities resulted in an 18% increase in reported wellbeing (using a WEMWBS based assessment). Our Nature4Health programme is being evaluated by Liverpool John Moores University. In the first year, results have shown an improvement in mental wellbeing on the WEMWBS scale of 12 points (3-8 points is considered significant). 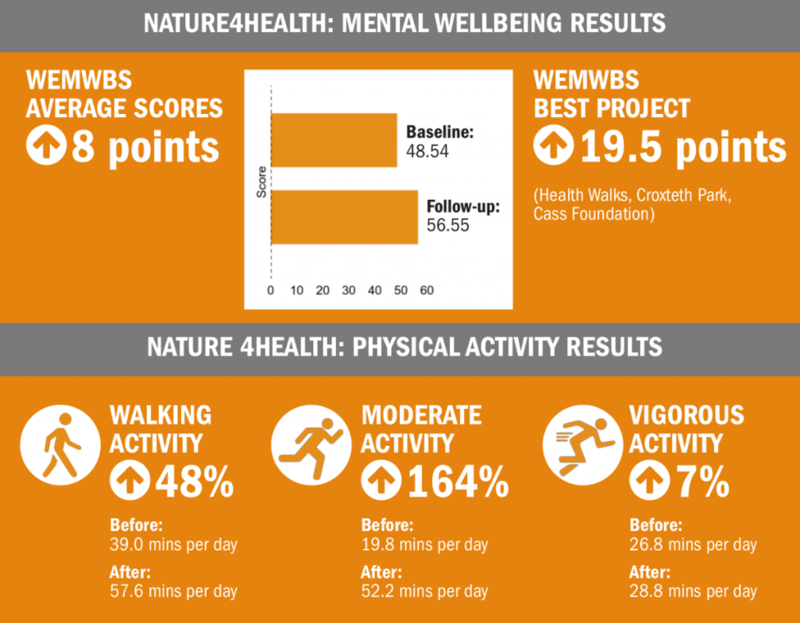 Our most effective project (health walks in Croxteth, Liverpool) resulted in an increase of 19.5 points on the WEMWBS scale. Physical activity in everyday life — walking, moderate activity and vigorous activity – all increased. Walking increased by 48% with moderate activity up 163%. We’ve found that the social aspect of the projects has been crucial to their success, reducing loneliness and building social capital.